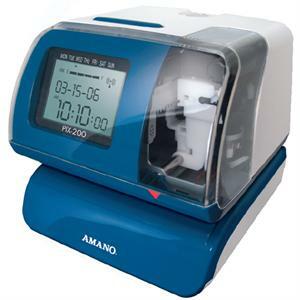 The Amano PIX-200 is the most affordable full-featured time clock available, designed to meet the typical needs and special requirements of contemporary business. The PIX-200 includes a wide variety of standard features and offers a set of optional accessories with unique functions. The clock is packed with features normally found in time recorders costing hundreds of dollars more. Two selectable hour formants (12 or 24) and choice of standard minutes, tenths or hundredths available. Dimensions: 6.4" x 6.3" x 6.7"